Show your love for the Twilight saga with this great collection of original fan-created designs. Twilight t-shirts, Edward hoodies, Bella gifts and more! This design is perfect for fans of Twilight's hero Edward Cullen. 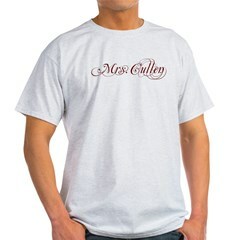 Wear a Mrs. Cullen t-shirt to show your love for Edward. A great gift idea for fans of the Twilight movie, too! 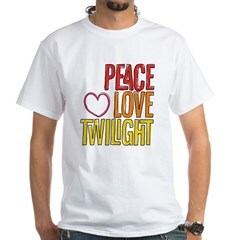 Peace, Love, and Twilight Tee Shirts Red, orange and yellow Twilight gifts for fans of the books. This design inspired by the Twilight novel series and the upcoming Twilight movie reads Looking for my Edward. 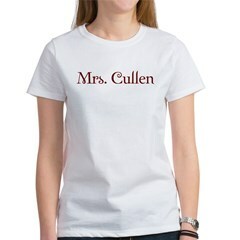 This is a great design for fans of the Twilight series who are looking for their own Edward Cullen! This design inspired by the Twilight novel series and the upcoming Twilight movie reads Looking for my Bella. 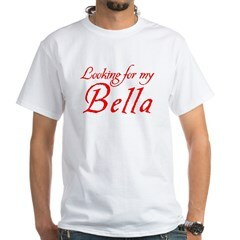 This is a great design for fans of the Twilight series who are looking for their own Bella Swan!